Novembers program is Bonkers! and it may drive you crazy! 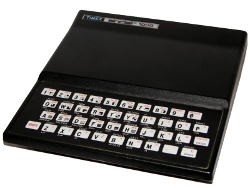 Simply use the ZX81 cursor keys to move your X around the field, avoiding the Os and their trails. Can you survive or will you go Bonkers? Okay, enough of the commercial, lets talk about the program. Yes, it will drive you bonkers. Why? Because I had to use FAST/SLOW to make sure it updated fast enough. It works, but sadly it ruins the flow of the game. This is one of the ugly truths with the ZX81. Because it uses the CPU to draw the screen, BASIC speed suffers. Of course, this is partly due to the what this game does. To deal with the objects moving, the program checks what is on the screen and decides what to do. It moves the objects, validates they didnt hit anything, and removes them if they do. If all stop moving, the level is over and the game continues. Personally, I like a lot of the code and the results. You can tell this program was written after Id gained some experience with the ZX81. It uses some pretty cool title graphics. I had fun with the design. The game board works well and the enemies are interesting. In a way it is like a game of multiple snakes, but you can pass over your own tail. I really like the death code. I wanted to print the score on a black line. There are six lines of code to convert and print the numbers as inverted text. Cool, huh? Well, if I put my mind to it I might convert this to machine code. There is a way to cheat, so if I do Ill need to change the mechanics a bit to avoid that. Until then, have a happy Thanksgiving and see you next month!